Joseph Pipa is known for his warm pastoral application of tough scriptural principles. Here, he takes an authoritative look at the ‘first day’ – the one set aside by the church for worship. This is an area of Church practice in which we find liberal interpretations practiced by evangelical churches and vice versa – often without too much thought involved and an emphasis upon what ‘feels’ right. Many of these issues are considered unclear, optional, divisive - with the unhealthy result that we tend to avoid the subject altogether. 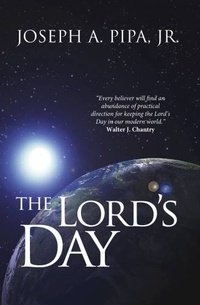 Are we missing out on God’s blessing by the way we celebrate the Lord’s Day - are we too legalistic, too lax? Is the Spirit grieved by our disrespect to God or frustrated by our thralldom to unnecessary restrictions? These and other questions are answered in The Lord’s Day.